A, You’ve had a sausage sandwich. B, You’ve had a chip butty. C, You’ve had a sandwich containing both sausages and chips. 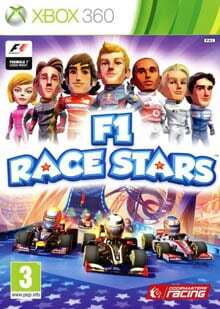 Now while I’m pretty sure that most, if not all, of you would have ended up an A or a B, I suspect that there are some Codemasters employees who would go for a C.
The reason I indulge in this preposterous intro to a game review is that F1 Race Stars is a game that wants to be a Formula 1 racer and a Kart Racer, and the result is something that may sound interesting at first, but is in fact somewhat hard to digest. 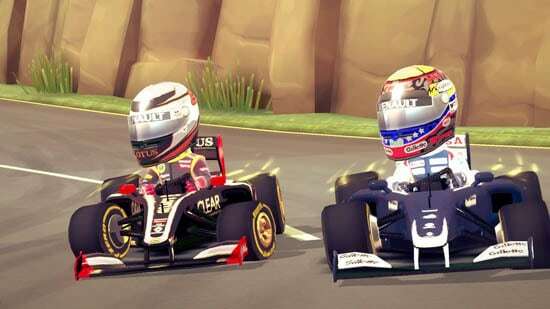 The only way that this was going to work is if they made F1 Race Stars look like one, but play like the other. This is not the case here and I can’t help but think that there were many returns to the drawing board by stubborn designers, determined to squeeze all the potential out of the F1 licence they proudly boast. 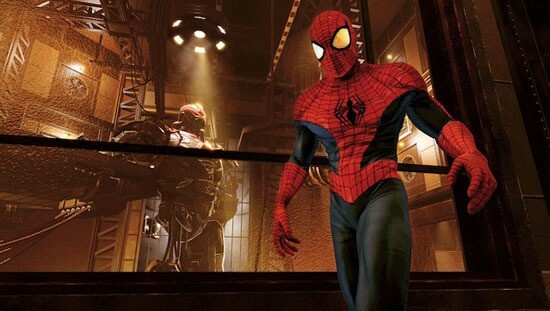 The game itself looks lovely. Everything from the menus down to each licenced driver’s caricatured noggin, with features making them instantly recognisable. The trackside decoration too is to be admired, as are some of the ideas behind the track design, if not the actual track layout itself. The theme throughout is a kind of stylised papercraft look, and it’s pulled off strikingly well. The track features are as exaggerated as the drivers’ faces. Race in Germany and you’ll find the track detouring off through a Bavarian castle and Japan will see you dodging sumo wrestlers as you yourself battle for first place. With weapons thrown in, the usual suspects such as missile both guided and not; metaphorical banana skins to leave behind for your opponents and, of course, boosts, it’s so far so good. Except when it comes to the actual driving of the cute little cars. Codemasters has seen fit to cunningly take the face rippling speeds achieved by your average go kart and expertly weave it in with the power drift capabilities of a Formula 1 racing car. Yes, you read that correctly (I hope). While we can see that power sliding would take the F1’ness out of F1 Race Stars, it also takes most of the fun out of a karting game if you leave it out. Similarly, while we can also see that having cars racing about at 200mph takes the cartness out of a game, it does a lot to recreate the white knuckle tension of a real F1 race. We’re back to that sausage sandwich or chip butty decision. Careful now, that car’s pulling out. If it was us, and we’re not trying to be more clever than Codemasters, it would have played like a karter and looked like Formula 1, because they really should have swayed more in one direction, and to have the opposite (plays like F1 but with no F1 liveries) would be mental. And so we’re left with a beautiful, fun looking racer with bags of potential, that runs a safe, sterile race. Not a glowing endorsement but still, despite its drawbacks, it has got character and it’s no bad way to spend your time on your own or with mates (local or online) if you’re after a pick up and play bit of fun between real races.